The message was signed by several longtime opponents of infant circumcision who are Jewish, including cultural anthropologist Leonard Glick, M.D., Ph.D. and pediatrician Paul Fleiss, M.D., M.P.H. The JCRC’s message also addressed issues of insensitivity toward Jewish people within the broader movement opposing circumcision. "Unfortunately, there may be statements and tactics by individuals opposed to circumcision that are insensitive and even offensive to many Jews. We regret this and absolutely reject all statements or actions, often based on ignorance, that are disrespectful of any religion or ethnic group," the statement says. Jonah Lowenfeld of The Jewish Journal of Greater LA yesterday reported on the JCRC’s statement as part of a longer piece on a newly filed lawsuit that seeks to block a vote on the San Francisco initiative. 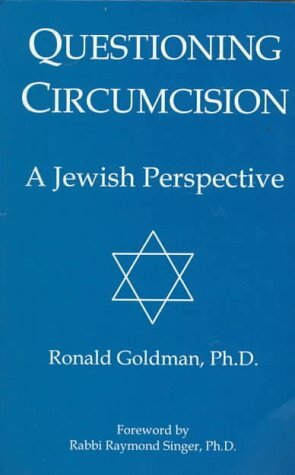 The Jewish Circumcision Resource Center was founded by Ronald Goldman, Ph.D. in the mid-1990s and serves to support the questioning of circumcision among Jews. Goldman says his organization decided to issue the statement because of the increased attention to the topic, accompanied by a general lack of awareness about the harm of circumcision. "There may be a misunderstanding of the reasons why many people question circumcision," Goldman says. "We wanted to clarify that and take the opportunity to raise awareness about the practice." He says he also wanted to assure Jews that questioning circumcision can be done respectfully and compassionately. Goldman was also struck by the response of others in the room. A few people were crying quietly, including the parents. Others were silent. There was an atmosphere of discomfort and anxiety. Goldman retreated to the kitchen, which was the farthest place in the house he could get. “I wanted to protest to others what was happening, but I restrained myself because I believed that people would not listen to me. This conflict caused me much distress. I resolved never to attend another bris,” he says. Goldman also resolved to do something about what he’d witnessed. He eventually published a book on the harms of circumcision titled Circumcision: The Hidden Trauma, and another book that addressed concerns specific to the Jewish community titled Questioning Circumcision: A Jewish Perspective. Both books have become primers on their subjects. Today, Goldman is Executive Director of the Circumcision Resource Center, a nonprofit educational organization with the purpose of informing the public and professionals about male circumcision. He maintains the Jewish Circumcision Resource Center as a separate but affiliated web site. Goldman says he feels questioning Jewish circumcision is best accomplished within the Jewish community and this is happening.